Home » Catalog » MAMMA MIA! Donna: Mamma Mia, here I go again. My, my, how can I resist you? Let me tell you. Just because I’ve been listening to ABBA almost non-stop since I saw MAMMA MIA! two days ago does not mean I enjoyed the film all that much. It’s just the Swedish pop super group’s music is so darn infectious. You would think that energy would translate to a feel-great good time at the movies but sadly this is not the case. First time feature filmmaker, Phyllida Lloyd, spends far too much time dragging her feet when they should be dancing up and down the beach and no matter how many shots of the moonlight shimmering against the waves there are, the film is still a clunker instead of a stunner. When a musical is paper thin on the stage, it runs the risk of being just plain silly on the screen. On the stage, MAMMA MIA! is a somewhat justified excuse to revive a bunch of ABBA tracks wrapped into a completely implausible, overly romantic farce. Young Sophie (played on screen by Amanda Seyfried) is but 20 and about to marry the very supportive and very handsome, Sky (Dominic Cooper). Something is missing though. Sophie has lived on this tiny Greek island her entire life and helped run a crumbling hotel with her mother, Donna (Meryl Streep) but she has never met her father. As far as she knows, he left before her mother could say anything to him but a chance encounter with her mother’s diary from the summer of her conception narrows the possible men to three. 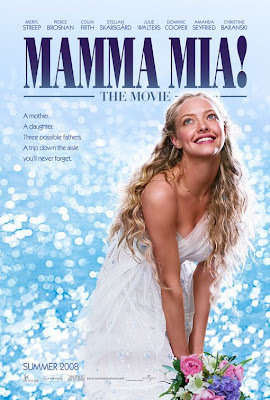 So rather than talk to her mother about her desire to know where she came from, she invites all three men (Pierce Brosnan, Colin Firth and Stellan Skarsgard) to her wedding, pretending to be her mother looking for a reunion. Naturally all three men accept the invite and hijinks ensue. While the campiness of the whole affair is forgiven on stage because the suspension of disbelief doesn’t apply, this screen version is too far removed from the stage to feel the least bit plausible. I believe in angels, something good in everything I see. 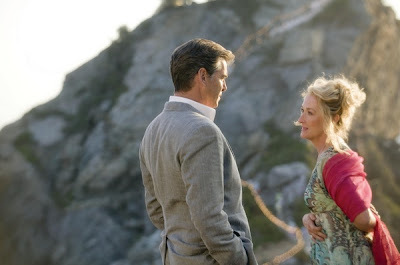 And while there is very little good to focus on in MAMMA MIA!, at least there is always the surprising Streep. She jumps up and down on beds, slides down banisters without the least bit of concern for breaking her hip and she can sing too. Much like her turn in THE DEVIL WEARS PRADA, Streep’s performance as the lonely mother of the bride carries the film forward and, in the show stopping “The Winner Takes It All”, elevates the film to heights it could never have achieved without her participation. 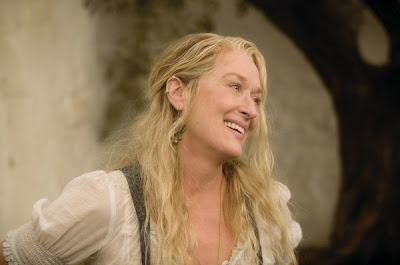 Though the two don’t get nearly enough screen time together, Streep and Seyfriend make a great mother/daughter combo. Seyfried’s fresh exuberance seems like it might actually be inherited from her movie mom. The rest of the cast delivers varying results – Julie Walters clearly thinks she is a comic genius but she comes off too brash; Christine Baranski is miscast as an older bombshell making for some particularly awkward moments with younger men; and someone should ensure that Pierce Brosnan never sings on screen again. Ultimately, MAMMA MIA! never connects all of its components. A melodramatic moment is followed by a peppy ABBA song, which somehow erases everyone’s pain. In that sense, ABBA’s music is the perfect choice to set the tone as it is some of the most depressing pop lyricism set to upbeat melodies in pop history. While the contrast adds weight to the songs themselves, the musical masking casts an air of falseness that never lifts on the film. What your left with is a compilation of poorly choreographed, plainly sung music videos. No offence, Meryl, but you are long past your MTV days.